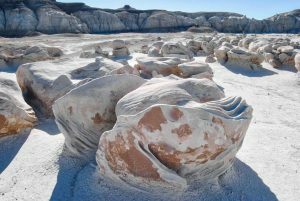 See the spectacular Rock Wings and Egg Hatchery in the Bisti Wilderness. 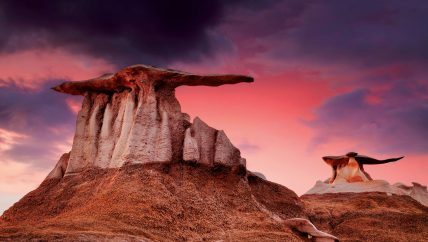 Bisti/De-Na-Zin Wilderness. A day tour on a planet's moonscape. See extraordinary land formations and earth tones. Join friends who want to get away from the office grind. 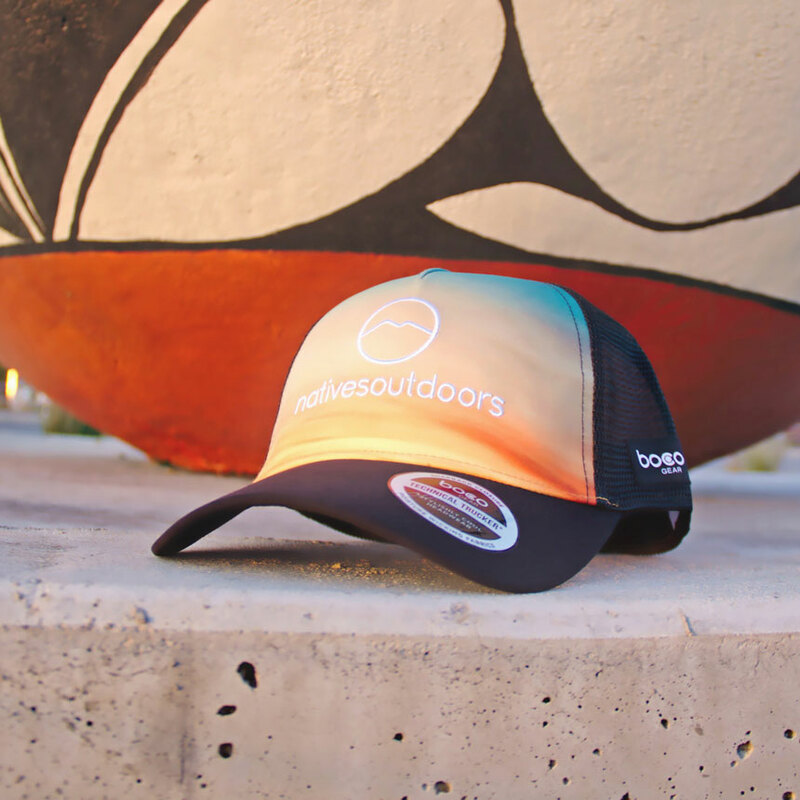 Pack your hiking shoes, favorite backpack, and sunglasses. 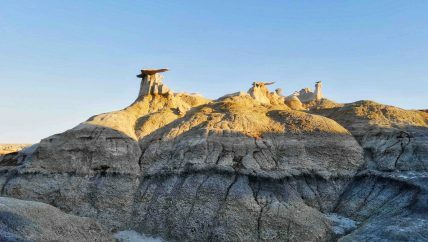 Bisti/De-Na-Zin Wilderness Adventure is listed among the Best Trips of 2019. Birthday coming up? Send a gift card. The beginning of Spring offers mild temperatures while visiting sites at Chaco Culture National Historical Park. 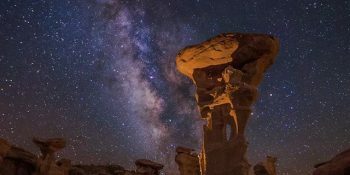 Book a tour May through August and enjoy our sunrise and sunset tours at Bisti/De-Na-Zin Wilderness and Crow Canyon Dinétah. Receive email notifications of upcoming group tours by subscribing today. Group tours have up to eight people, and offers a wonderful experience with other Bisti enthusiasts. Check out the upcoming Easter Sunday Tour - April 21st. 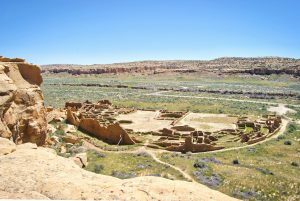 Walk through the corridors of Pueblo Bonito at Chaco Canyon - the main epicenter for cultures traveling the region between 850 A.D. to 1150 A.D. Or, visit a fantasy land of rock formations at the Bisti/De-Na-Zin Wilderness. 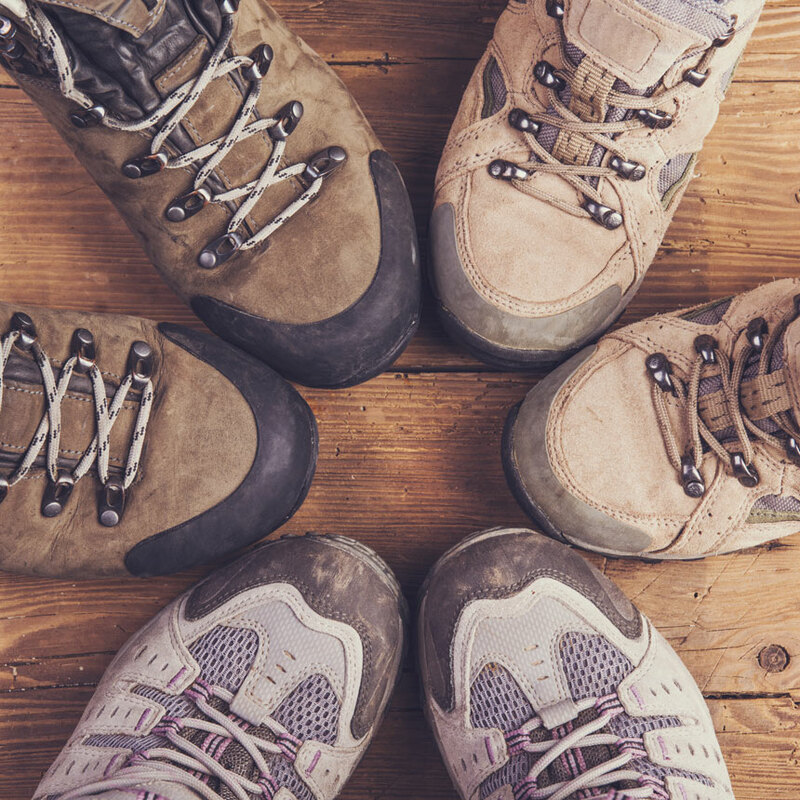 Unique outdoor recreation for office-fevered friends . Need to book a private tour? We welcome our national and international guests. "TERRI & KIALO ARE INCREDIBLE GUIDES. We took a wonderful 5 hour walk in Bistah, and Kialo & Terri shared cultural and informative information about the area. Since we are retirees, and have limited abilities, Kialo and Terri were respectful to our abilities throughout the tour. We had plenty of rest and snacks on the tour. We have traveled to a lot of places across the U.S., and this is now our favorite spot!" 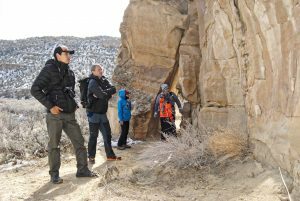 "We took the Crow Canyon tour and it was a wonderful experience, educational and deeply moving. We learned so much about the history of that magical place and the many people who have moved through it down the centuries. Kialo, Terri, and Gilbert were so warm and welcoming that we very quickly felt as if we were walking with old friends." My family and I had an AWESOME guided tour of the Bisti Wilderness on Easter Sunday 2018! To experience this exceptionally stunning place with our guides, Kialo and Terry, who are deeply connected to the area via their indigenous history, was second to none. We were able to see some of the "rarely seen" of Bisti and our minds were blown. Truly an out-of-this-world experience. "We had a private sunset tour with Kialo and Terri. They are very professional. The landscapes are phenomenal and this was a great opportunity for beautiful photography. We had a great time. We recommend this company without hesitation." "My husband and I took a tour with Mr. Winters and it was an experience we will never forget. The landscape was beautiful and Mr. Winters and his crew were experts who knew exactly what paths to take to get the most out of our tour. Thanks so much for sharing your history with us." 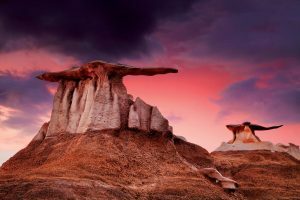 "Kialo was a great tour guide in an area where you can get lost and die [Bisti/De-Na-Zin Wilderness], or at least spend a lot of time trying to find your way around. I hope to see them all again someday." 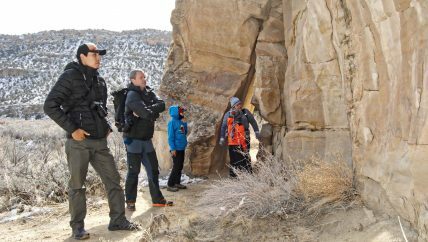 "We were lucky enough to meet Kialo & Terri from navajotoursusa.com #NavajoUSA while hiking through the Bisti/De-Na-Zin Wilderness and they were kind enough to show us around." 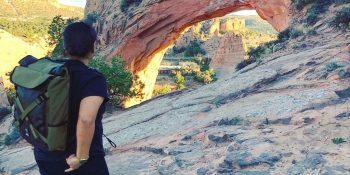 "Seriously, I can't recommend Navajo Tours USA enough. Enriching and grounding. And it was SO much fun!!" 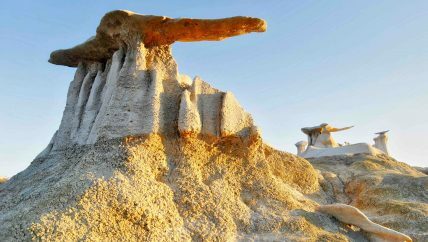 Bisti badlands is definitely amazing for anyone who loves nature and landscape. Kialo and Terri are excellent guides and super helpful. They really do know that area, and very knowledgeable about geography and everything there. And you absolutely need someone who is familiar with the badlands to get around. There are no marked trails, nor would you have any phone signal. And you won’t reach those amazing spots till walking about 30 mins. with no directions at all. Bisti is big and too big for one trip. I would go back and would go with them again. Kialo impressed me from the moment I booked the Bisti badlands tour until it was (sadly) over. 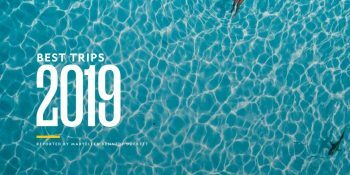 No detail overlooked, every possible question cheerfully answered beforehand, walking poles and water refills provided, and a feeling of spending time with a good friend. Arranging for Kialo to pick us up at our hotel was an excellent idea - no need to worry about getting lost!! I look forward to booking other tours with Kialo. There's still so much more of the badlands and other beautiful sights to see, and there's no one better to see them with. My wife and I took a guided tour of Chaco Canyon with Kialo and Terri. Great experience. 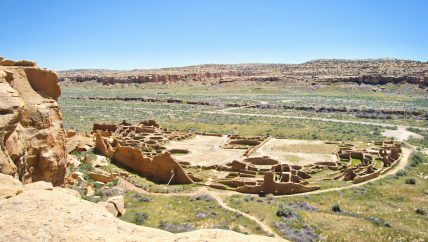 It was truly fascinating to get a Navaho perspective on the history, mythology, and culture related to this ancient civilization at Chaco. Hope to return to the area sometime, and further explore some other sites with them. This particular tour (Bisti badlands & Three Kings) was SUPER! Kialo, Terri, and Gilbert provided a wonderful time amidst the most bizarre landscapes I've ever encountered. The walks were paced well with consideration of the high heat we encountered. Trekking poles and water bottle refills were provided (you can never get enough water in the badlands). I highly recommend using Navajo Tours USA for exploring this region; no detail was overlooked! 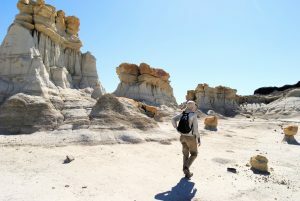 I would arrange further exploration of the the Bisti badlands with Kialo; we only saw a part of it on this trip! Kialo and Terri are wonderful guides into this fragile and magical natural wonder. We watched the sun come up at the "Three Kings" then hiked into the "Valley of Dreams." It was a wonderful experience from start to finish. I would definitely recommend this adventure as the highlight of any trip. They are respectful of the land, and thought of everything. Thank you again Kialo and Terri! Kialo and Gilbert were X.L.N.T.!!!!! guides for my trip to Bisti badlands. Will definitely use again and recommend to anyone.